Here is a mystery. But not the intriguing sort. The baffling sort. The frustrating sort. Indeed the infuriating sort. The Waking World is a very accomplished and highly exciting debut from a clearly most talented young writer. 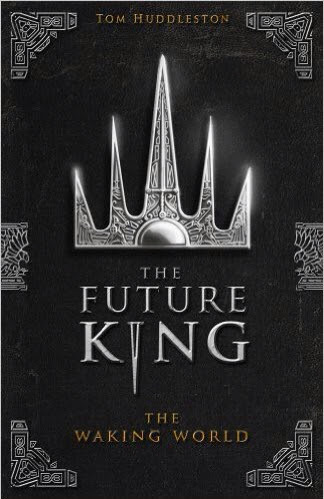 It is blatantly intended as the opening book of a sequence, The Future King. It was published as a handsome hardback volume, obviously (and justifiably) valued by its publisher, back in 2013. I first read it then and have since been looking out eagerly for the next part. Yet the rest of it seems to have melted into air, been stolen away from fairyland, or, angels and ministers of grace defend us, come to dust. (Excuse the mixed bardaphores.) What is going on here? Over the years there have been many fine children's and young adult novels reworking the story of King Arthur, some developing the legend, others trying to reconstruct a putative history of the warlord who may have led resistance to the Saxons in post Roman, 'Dark Age' Britain. (See my discussion in Oct '15 of Philip Reeve's Here Lies Arthur.) It is such an archetypal story that it provides wonderfully fertile ground for fiction. And now Tom Huddleston has conceived this story anew through the reinvigorating leap of focusing on the future element of 'the once and future king'. His reimagining is set around 1000 years into our future, in a world not so much post apocalyptic as post climactalyptic. Here is a society that has reverted to another dark age following the literally devastating effects of climate change. Of course this is not in itself a particularly original concept, but Tom Huddleston's realisation of this world is imagined with wonderfully convincing and compelling vigour. Here is a north of England shrunk drastically by higher sea levels and dotted with battened-down, subterranean farmsteads whose names, like so many other aspects of broadly 'Iron Age' society, carry distorted but pervasive memories of their earlier incarnations. Within this context are introduced some key 'Arthurian' tropes, a boy destined to be King (here called Aran), an enigmatic mentor (Perigrine) and the very real terror of raids from malevolent and vicious invaders (here referred to as the Marauders). However, as yet, these only carry with them hints of the original myth, subtly and intriguingly introduced; this is no slavish retelling, far from it. A good part of the author's success in so effectively conjouring this world comes from a skill in the use of language that is frankly astonishing in a debut novel. Tom Huddleston's descriptions are vivid and fresh minted without ever being florid or 'purple'. He has clearly imagined himself right inside this world and he makes us see and feel it too. He has a way with prose building too which is quite delightful too; his phrases and sentences varied and balanced. They communicate strongly whilst beguiling the reading ear with mellifluous dances. When I was still teaching children to write I loved to share with them models of writing worthy of emulation, as I firmly believe the only way to learn to write well is to read well. Had I The Waking World to hand then I would certainly have read passages aloud for inspiration, not least some wonderful sections from Chapter 15 when Aran's 'magician' tutor first bring him to the forest. However Tom Huddleston's reimagining of this apprenticeship is worlds away from The Sword in the Stone, as told by either T H White or Walt Disney. The early parts of the book feel much more like Bernard Cornwell for a younger audience and build to a most exciting early climax when the Marauders unexpectedly raid a large market/fair gathering to devastating effect. The middle section of the book explores more quietly the relationship between the young Aran and two friends, a feisty girl and a gentler, more reflective second boy. Again this is an almost classic grouping, but these characters are, like most in this book, richly and credibly drawn. They lift off the page and draw the readers into committed identification. The various, at this stage rather childish, adventures of this trio entertain and delight, providing a more relaxed interlude before the narrative again winds up to thrilling tensions. Once Perigrine takes Aran to his special island, however, the novel lurches most excitingly into yet other world, where at least hints of the magic and esoteric knowledge of the original legends begin to make their presence felt. From this point on the narrative wakes as a veritable serpent and twists and turns surprisingly, intriguingly, and ultimately shockingly. We have a master storyteller at work. At the heart this fiction is, of course, the classic tale of a boys awakening to his own potential and hence to his destiny. But its telling is fresh and vivid altogether remarkable.This book may come to a relatively cosy, short-term resolution, one based on what is for its relatively young audience (and perhaps for our immediate time) one of the most important of messages, that violence only begets violence. However it opens more doors than it closes. Not only is Aran awakening to his own role as King, not only are all involved awakening to the possible reality of magic, but both their world and the author's fiction are awakening to a future where their past, our present, is insinuating itself back into the narrative in startling ways. This time confusion, introduced at first through only the subtlest of hints, has by the end of the book become crucial. The future of this future king is both intriguing and disturbing. It is not quite the story we expected it to be, and its anticipated development, so skilfully set up. will, we feel, be more different yet. As readers we are left with more questions than answers. We are also left with a desperate need to explore them. The end of this first book may not literally leave its hero's nails scrabbling for purchase at the brink of a precipice, but it is no less of a cliffhanger for that. The final sentence of the narrative is 'What next?' It is equally the abiding thought in the reader's mind. This debut is a triumph. It has an original and intruguing concept with a fascinating twist on a potent legend; it has masterly use of language that enchants the 'reading ear' and conjours vivid pictures for the 'imagining eye'; it has a compelling storyline that engages both mind and emotions, jolting both characters and reader from one understanding of this world into something quite other; it has rich protagonists who attract enormous empathy and characters with deep complexity and moral ambiguity; what more is there to ask? The answer to that returns me to my opening issue. Because what more there is to ask is the rest of the sequence. This first book may be a triumph, but it also holds the most intriguing of promise that what is yet to come will constitute an even greater whole. The Waking World cries out for a paperback format so that it can reach a much larger audience. It needs wider publication, in the US in particular, where this combination of legend and fantasy will go down a storm. More than anything though it needs its sequel - and soon. These first two things this remarkable debut deserves. The last the reader deserves. What is going on here?